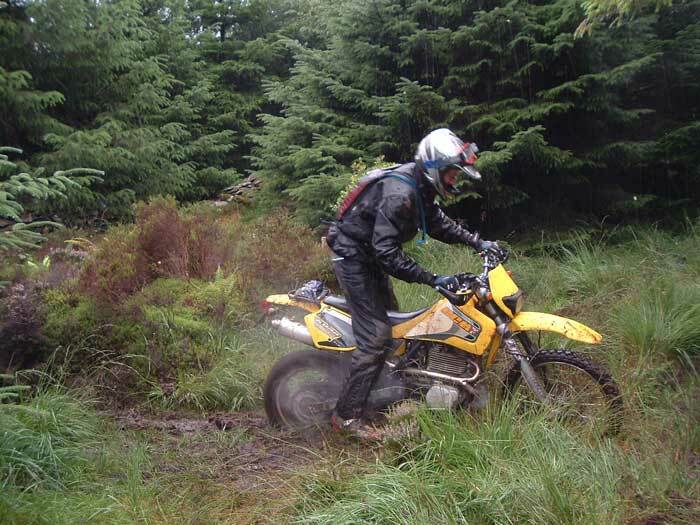 5 am on a soggy Saturday saw various vehicles loaded with motorcycles heading off to a campsite in the hills near Bala with the intention of getting some serious trail riding done. A rendezvous in a field by a river after directions from a young lady with a tanned midriff saw 6 hardy souls prepare their fine steeds for a days combat. Just as we were setting off who should pop up from the bushes but that pseudo Welshman with a registration plate that is best suited to his old Capri. So off we set, Pete, Anthony, Taff, Paul Waycott, the Mikes Allan and Edwards and yours truly. It's important to give an impression of the atmosphere of the day. According to Audrey Hepburn the rain in Spain stays in the probably rather damp plains. Well in North Wales 95% of it stayed happily in my jacket. There were a few moments when it wasn't raining. At those rare times it was absolutely persisting it down. Just take that into consideration when imagining the day's activities. The lanes north of Bala are not new territory to some of us and so it was a fairly straight forward morning, well in theory anyway. With Rag , Tag and Bobtail following me, we headed off for our first lane, a drop down over a rather slippery field into a reed filled sunken track that needs a fair amount of enthusiasm to get along with no problems. A perfect CCM lane, 3rd gear and don't get too close behind. Judging by the time needed for the tail end Charlie to get to the final gate, it didn't suit every ones bike. A quick mile down the single track road saw us at lane 2. This starts with a flat gravel and grass track that changes its nature on passing through a gate. It now turns into a sunken ditch, reed filled and to some extent impassable if sensible, non damaging progress is to be mad. This means that a delicate balancing act along the banks is needed. Failure means a fate too terrible to behold. This lane gradually morphs into a tractor track and then a bulldozed motorway through a gravel river and tarmac. The final challenge is a farmyard with a myriad of gates and dogs. To this point everyone has stayed shiny side up although the bikes aren't all that shiny any more. Nor is the weather! Ysbyty Ifan is easier to pronounce than spell. It also has several good lanes nearby. An old favourite is an "out and back" dead ender, finishing on a county boundary. 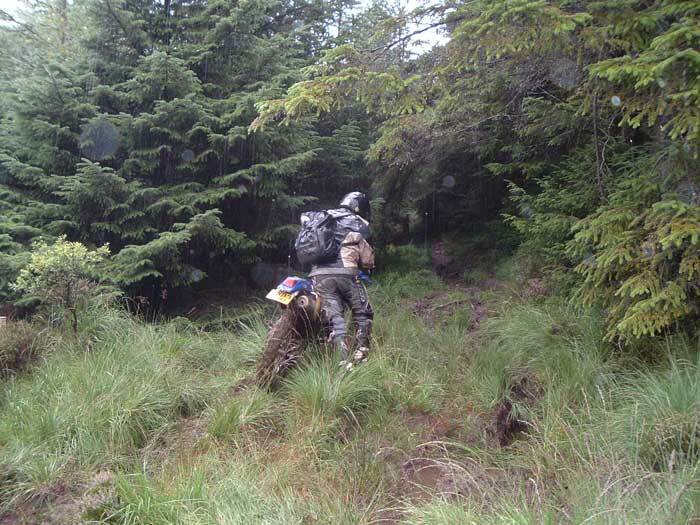 Never mind, nobody minds riding several miles of ancient stony track with big puddles, slippery rock slabs and sneaky grooves worn by old style steel shod cart wheels. Then you turn round. Right at the end there is a rather deep hole that is not noticeable due to the 18" of water in it. Previous knowledge here does help to avoid a wetting. Pete and I had been there before, the rest hadn't. By now the failings of peoples waterproofs were coming to the fore. Out of the village and heading west a short linking lane that has been reworked in the last couple of years by the council proved still to be able to slow a few people down. Moving on again we came to a longer cart track that's just easy enough to move quickly but just awkward enough to cause people to slow down at times. The west end used to consist of a descent over some off camber slabs that surprised people with some short sharp drops. Nowadays its been graded and its just slate and stones but with some diagonal gullies to make sure you don't go to sleep. We are now in Penmachno, a place that in my college days was regarded as the sort of place that the banjo playing kid in the film Deliverance might have lived in. It does have a nice pub though but we were strong. Actually several of us knew what was coming and the others didn't know were they were anyway. 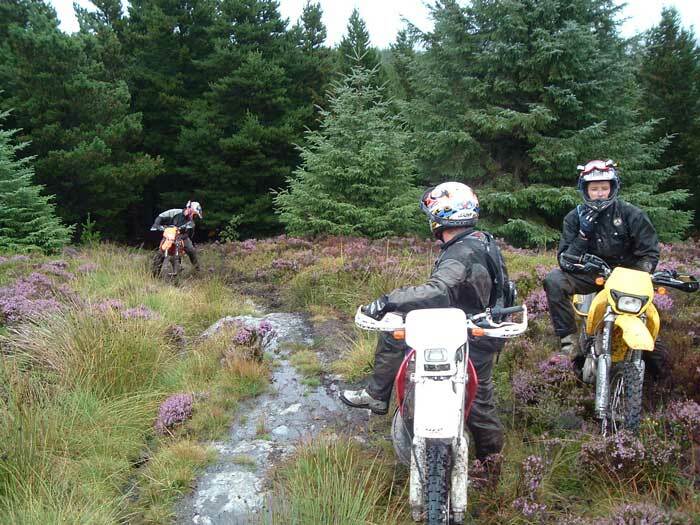 Ancient riders out there remember the Monks Trod, a brilliant 6 mile lane/bog that's sadly now closed. The next lane resembles the Trod but with fir trees! Our first trip over it happened a couple of years ago on our north to south trip. 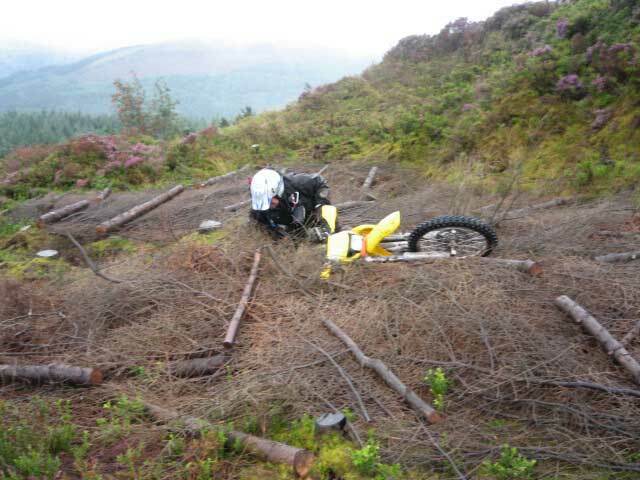 On that occasion Colin Davies nearly had a heart attack and vowed never to go near a trail bike again. The lane starts harmlessly with some deep clay ruts overgrown with conifers. Just the thing to put people on their ears. Pretty soon proper bog was met. At this point Paul decided that it would have been nicer if his recently acquired 525 had a battery that worked. 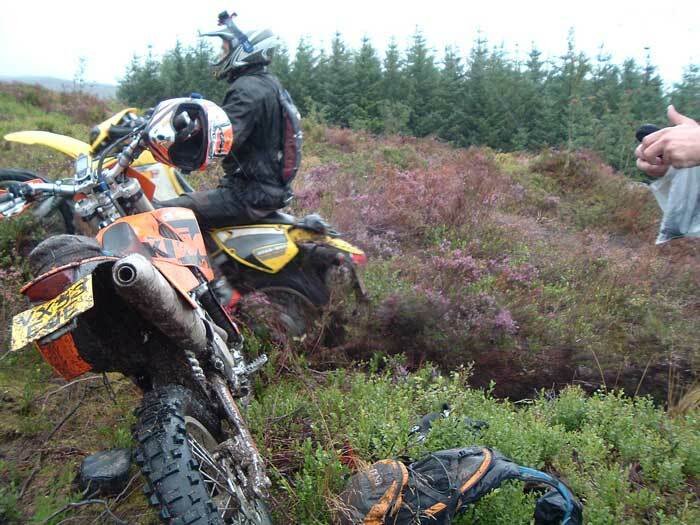 Oh well at least it was easy to get his foot down, the bike being up to its sump in the bog. I believe that there might be a picture or two about somewhere. The benefit to this was that he had time to watch us all sink, fall off or just get well mired. Things were beginning to take on a pattern that was to become oh so familiar. To describe every little incident would get even more tedious than the rest of the article but suffice it to say that at no point were all 7 of us moving. One or two pictures will help to give an idea of the lane. The ones showing sunny weather actually date from our end to end trip 2 years ago. 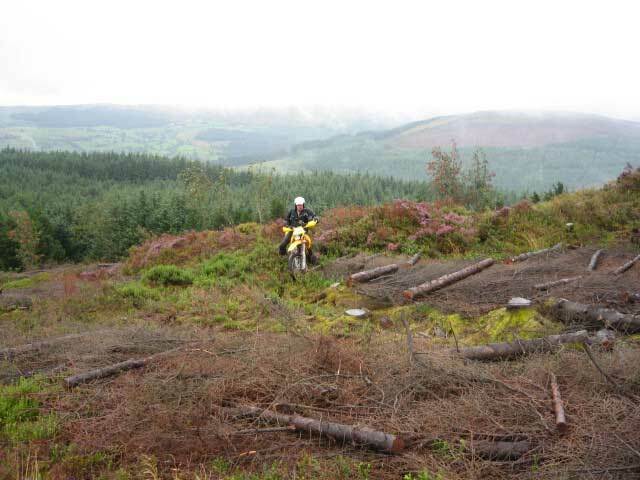 Bog is hard to ride but uphill bog with felled trees is real fun. One point saw us all spread over an area the size of a tennis court, all stuck or about to be, tyres spinning wildly on bare slate and front wheels buried to the hub. 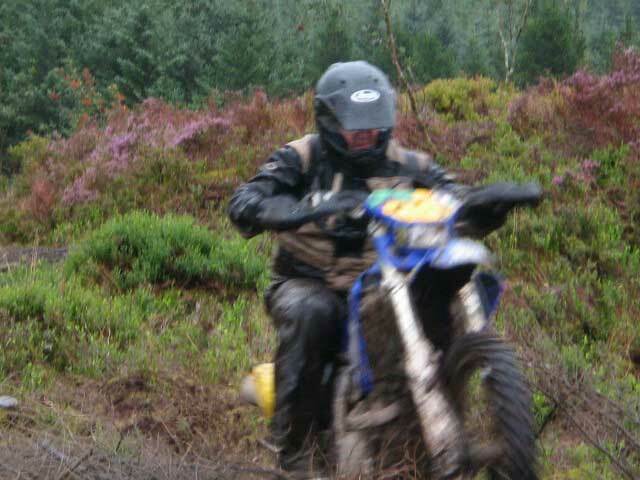 Eventually the high point of the lane was reached after a final splash through another bog that looked bottomless but had a hard gravel bottom about boot depth down. Neither of the Mikes believed me when I sent them down the correct line. It looked deep and both came a cropper, especially the Edwards version when they avoided the indicated line. I can't imagine why they wouldn't believe me. It's also a bit surreal to find a new gate up here. The second part drops to a typical North Wales valley. Our previous trip saw us coming up to this point and we took an hour to cover the mile or two of soggy hill side. This time we found the old track, used only by sheep and dropped to the road, gradually using more and more of an old stone road. We were wet, muddy and hungry so a blast down the tarmac saw us on the Roman road to Betws y Coed. Old stone slabs and cobbles with few deep puddles brought us to Forestry and eventually the petrol station at Capel Curig. At this point probably the most unusual event of the week end occurred. A trail ride with me leading actually stopped at a café and sat down to a meal!!!!!. I think several members of the group were rather surprised by this, Mike A and Anth (knowing how things usually go) actually buying butties and settling down in the rain outside only to realise that something more civilised was happening. They soon joined in with the all day brekkie though. Putting wet gear back on wasn't fun but the clever one amongst us had a dry fleece in his rucksack. Glad I put it in. Bodies and bikes fuelled we set off. Another old road out of Capel saw us warmed up again. Tight turns, big rocks and adverse cambers saw a number of us having a moment or two. My arms hurt so much at the top I was ready to give up then but the old KTM dummy was not around so I had nothing to spit out. Not sure what Mike E was up too. Perhaps he went back for a second go! 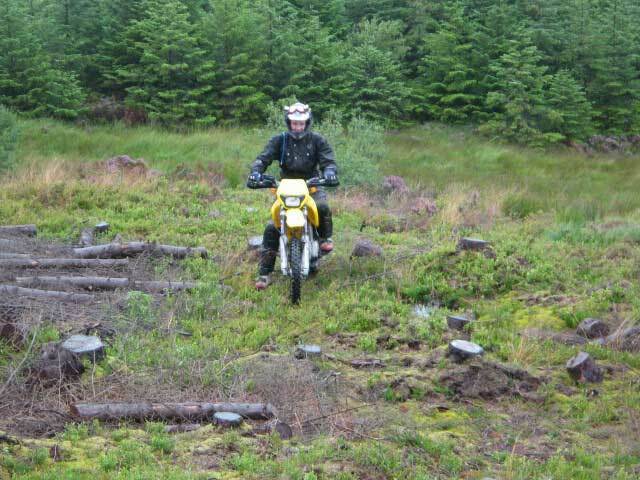 A quick rattle over the stoney track, a bimble down the forestry track and we were back to the superbog. Well actually we took to the road and went back across the graded track we had used earlier. At the end of this we took to a RUPP that I had passed several times before but had never used as I plan routes in unfamiliar areas using only BOATs and UCRs which are generally less arguable. With the forthcoming implementation of NERC in Wales I though that it would be worth a try. As I was it was worth it. Old tractor ruts covered in thistles proved interesting. The UCR at the end proved to be tarred and not what we wanted. We now headed off north of the A5 for some new lanes. What we found was great. Long lanes, washed out in places, just muddy enough were worth looking for. Minor entertainment was provided but Taff doing a lovely somersault after clipping a fence post stump whilst going through a gate. Excellent.. 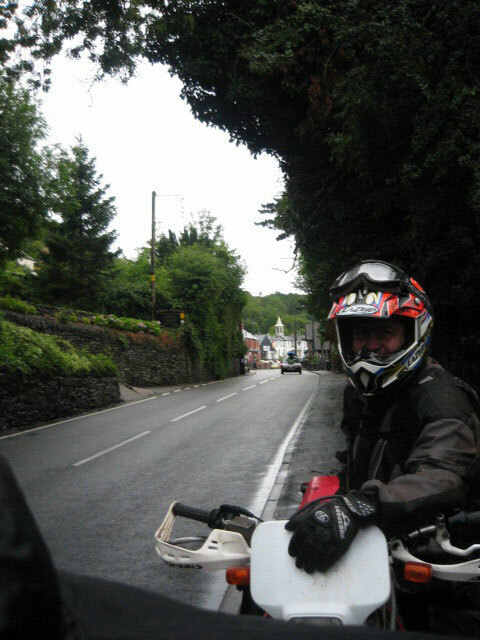 The plan was now to bomb off down the A5 to Cerrigedrudion, shoot up to the moors, do a few lanes and eventually end up near Llangollen to work our way over the Wayfarer and back to Bala. Well you know what they say about mice and men! Some how a farmer towing a wagon load of pigs or something got behind Taff, following me, and blocked the view of the rest of the bunch. Suffice it to say that they kept going down the A5 whilst me and Taff headed for the hills. It could have been worse I suppose. The A5 ends in London! Changes of plans meant that somehow we met up as the big bunch were spotted hightailing it out of Corwen on the Bala road. 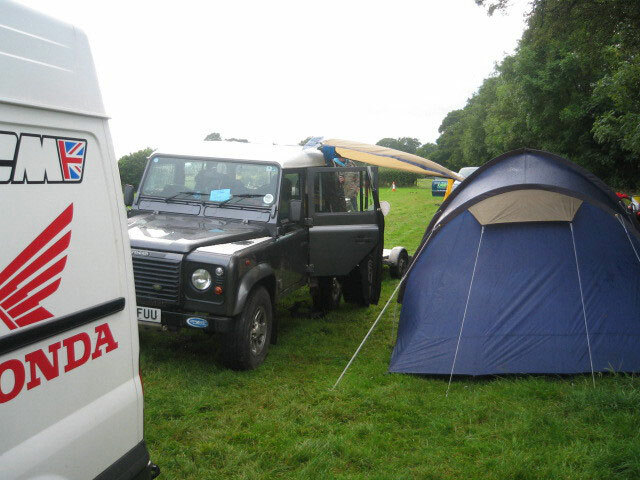 Mr Allan and Pete cleared off and were next seen back at the tents. The rest joined us two and we went for a final lane that runs out of Llandrillo through a farm and up to the main road to the campsite. This time a sometimes open farm gate had been replaced by solid wooden gates over head height . Peering around the first one I caught the eye of a rather vague looking chappy who eventually stopped feeding his fowls and opened the gates for us. He didn't seem particularly interested in us and closed several gates after us. This lane is easy enough at walking pace but rather more challenging at anything else. We worked hard here and as is usual totally ignoring the need to preserve fuel for Paul's thirsty 525. Another set of magnificent gates saw us out of woods onto the moors. 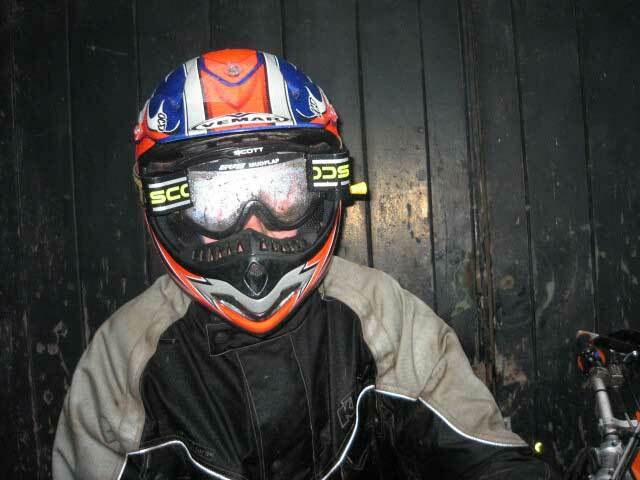 Waiting for someone to relieve themselves gave a chap on a quad to appear behind the gates. " You aren't supposed to be here" he said. "Oh yes we are" said I "it's a county road" "Oh is it"? was the reply, " fair enough, have a nice day". Reckon he was worried about his pheasants. A bit of road racing soon separated the cautious riders from those with cold wet gear and the multitude of gates through the campsite were dealt with. Back at the tents it stopped raining. Damn, why now? Soon the field looked like a gypsy encampment, albeit not so colourful. Wet jackets draped on trees and boots on fence posts. Despite the balls up on the A5, for which we decided to blame Taff, plenty of lanes were done and that first beer went down beautifully. Those of us with a better sense of planning and a realistic view of the weather shoved everything into polybags to fester and be sorted out at home.. Hopefully tomorrow would bring some better weather.